Honda is the new No.1 two-wheeler brand in more than half of India! 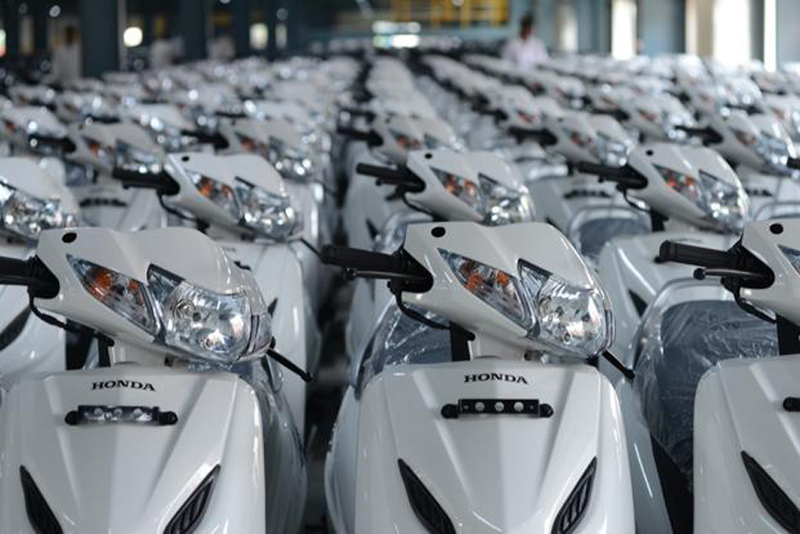 Creating a new record on back of market demand, Honda 2Wheelers India is the new No.1 choice of two-wheeler customers in more than half of the Indian 2Wheeler market. Honda is now the No.1 two-wheeler brand in 15 States and 2 Union Territories of India which together account for a massive 52% of all two-wheelers sold in India. 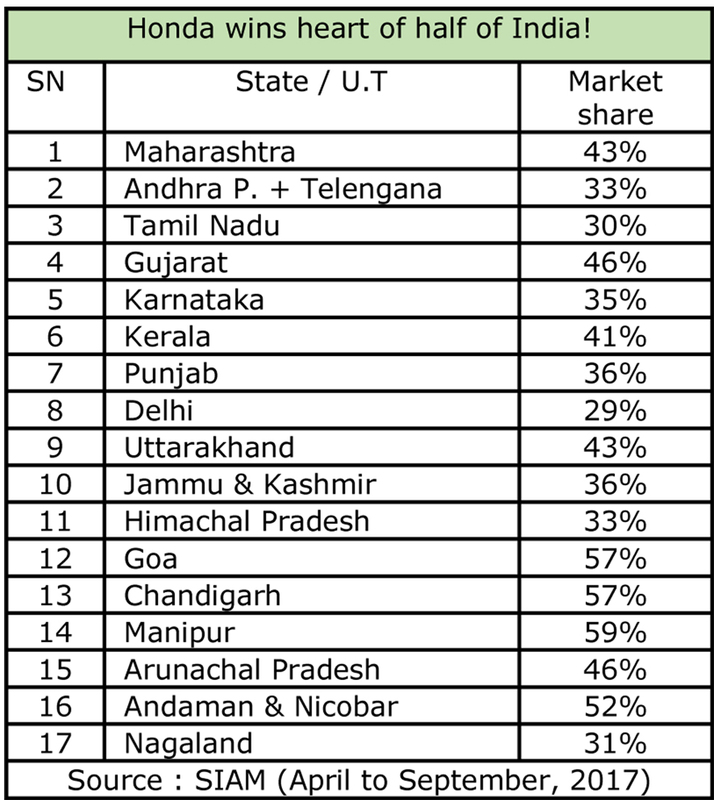 These 17 markets include entire West region (Maharashtra, Gujarat, Goa), entire South region (Andhra Pradesh & Telengana, Tamil Nadu, Kerala, Karnataka) in addition to Punjab, Delhi, Jammu & Kashmir, Himachal Pradesh, Chandigarh, Uttarakhand, Manipur, Arunachal Pradesh, Nagaland and Andaman & Nicobar Islands. Noteworthy that Honda has gained a quantum leap of India’s love and trust in only 6 years. 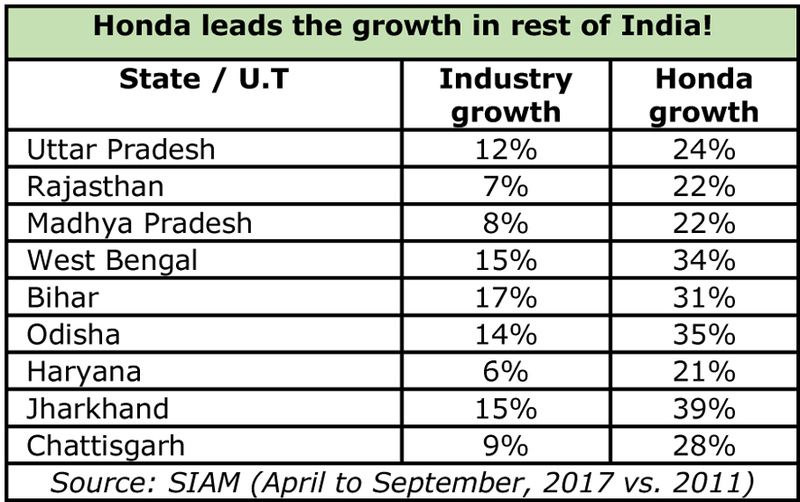 Honda’s market leadership has exponentially grown from just 1 State & 1 Union Territory in 2011 (Arunachal Pradesh and Goa) to 15 States and 2 Union Territories in 2017. In the other big demand States of India, Honda continues to outperform and sales are increasing double the speed of two-wheeler industry in the past 6 years.